A little over two years ago, when Sam heard about her 6th grade science fair, she couldn’t wait to begin. The prompt was pretty straightforward: develop an invention that betters or improves something regular people are faced with in day-to-day life. As someone who’s always thrived in the arts, Sam didn’t anticipate bringing home gold from the Cape Fear Academy Middle School Science Fair. Even more surprising were the two patents that came out of it. Of course, as an accomplished academic, musician and the youngest performer in Opera Wilmington, Sam is not only well acquainted with exceeding expectations, she also regularly stands out. This past year the opera company actually created a new role for her in their production of The Merry Widow to complement her mature singing voice. Additionally, when she started 6th grade at Cape Fear Academy Middle School, her educators immediately took notice of her natural gifts and the seemingly boundless efforts she puts into all her work. Cape Fear Academy, located in Wilmington, North Carolina, is a private college preparatory school with virtually 100% of all graduates going on to attend college, both in the US and abroad. The annual Cape Fear Academy Science Fair is a required part of 6th, 7th and 8th grade curriculum. Coming from a background as a collegiate level educator, first year teacher Jamie Bonetti decided to give the 2012 science fair a unique twist. She and the other Cape Fear Science Fair organizers challenged their middle school participants to make their own inventions, ones that would better everyday life. To kick off the project, students were instructed to first learn the theory and history of invention. After they had researched famous inventors and studied up on the invention process, they were to brainstorm their own inventions. In doing so, they were encouraged to explore the world around them and interview their friends and family. Was there something they’d like to improve about the world? Did they have a product in mind that they wish existed, but didn’t yet? After they identified their invention and outlined the project in detail, they then submitted proof-of-concepts to propose their respective ideas. Once the teacher approvedv their concepts, they were permitted to move forward with their ideas. Students were limited to a modest budget of 30-50 dollars to buy supplies. Cape Fear Academy is located in Wilmington, North Carolina, a beach community nestled alongside the Atlantic Ocean. As a result, many of the students decided to focus their projects on problems that affect beach goers, i.e. boogie board carriers and sand trappers. Other students created solutions to simplify household chores like cleaning or carrying groceries. Though she did not know it at the time, what Sam would ultimately come up with would be slightly more complex. The idea first came to her during a conversation with her mom. When she asked her mother something she’d like to improve in the Melin home, the two identified a reoccurring problem: silverware falling into the kitchen sink’s disposal. It seemed like at least once a week a fork, knife and/or spoon found its way into the disposal while it was running. It was damaging both to the silverware and the disposal. Moreover, the problem spanned far beyond the Melin household. Under-sink disposals are very common in U.S. homes. While the disposal’s purpose is to diminish organic matter for the sewer system, they are not equipped for bottle caps, eating utensils and jewelry. Alas, those items inadvertently find their way into the disposal causing damage, destroying the item itself and sometimes requiring a plumber for repairs. Sam knew the best way to prevent the problem was to catch these items prior to them entering the disposal. She decided the solution should include a detector located at the opening of the disposal, an alarm light, a warning buzzer and a mechanism that turns off the disposal as soon as metallic objects are detected. After some brainstorming, Sam developed a prototype of the invention complete with a list of the necessary parts. The preliminary design included a sensor coil, circuitry and alarm light. The metal detector coil encircled the entry point of the disposal, acting as a sensory gatekeeper for any unwanted items entering the disposal. The power mechanism for the disposal and an alarm light were connected to the coil via circuit. Whenever an unfit object entered the disposal, the sensory coil would detect it, stopping the disposal and illuminating the alarm light. Following the protocol for the development for her invention, Sam presented a proof-of-concept blueprint to Bonetti. The blueprint embodied the purpose of the Silverware Saver, the design and listed the parts needed for assembly. Bonetti quickly approved the project, giving Sam the green light to move forward with the model. Sam picked up a metal detector kit off the shelf at a hobby store and purchased the other materials at a home improvement shop. The project required detailed assembly. 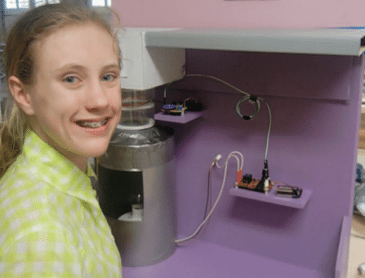 She spent hours in her garage constructing a mock model of a conventional sink with a mock disposal, positioning the sensor coil, connecting the power source and soldering the components to the circuit board. Sam also put the invention through a number of tests, making sure it worked perfectly. Tom Melin, Sam’s father, was extremely excited to see his daughter’s engagement in her science fair project. Tom, a neurosurgeon, has always been dedicated to the sciences. In contrast, his daughter had previously paid most of her attention to music and the arts. It wasn’t until the 2012 Cape Fear Academy Science Fair that Sam developed a keen interest in science and a passion for invention, something her father could truly relate to. Tom worked with his physician’s assistant, Sean Hensler, to invent a surgical device that went on to be patented, FDA approved and is now nationally and internationally distributed. The Hensler Bone Press acts like a French coffee press to collect live bone tissue during surgery and then drain blood from the bone matter. Before this invention, it was regular practice to use several thousand dollars worth of synthetic materials in place of the bone tissue. This invention made it possible for a person’s own living bone matter to be reused in another part of their body during a surgical procedure, saving money and time and improving patient care. The night of the Cape Fear Academy Science Fair on April 26th, 2012, approximately 10 weeks after her original brainstorm, Sam Melin had preliminary copies of the patent application to display beside a working model of the Silverware Saver. To present along with her project, she also developed a fictitious company name (SMELIN), logo, jingle and prospective buyer testimonials. As the founder and CEO of SMELIN, Sam presented The Silverware Saver with confidence and ease. Parents, faculty and her 150 classmates all had the opportunity to watch her demonstrate the custom-built sensor coil, shut-off mechanism and alarm light. Sam ended up winning both the popular (made by science fair attendees) and faculty (Cape Fear teachers and staff) votes. Emerging victorious, she had bigger plans for the Silverware Saver than ever before. Now, more than two years since the science fair, Sam’s science fair project and subsequent Internet search led her to obtain two distinct patents. While there wasn’t an existing patented concept that matched the Silverware Saver’s, the closest one out there was held by InSinkErator. While the InSinkErator product also detects foreign objects and shuts off a disposal, it was fundamentally different than Sam’s invention. The disposal only cut off once a spoon or fork has made its way down to the disposal’s grinder plate. In contrast to Sam’s product, which detects silverware at the in-take to the disposal, the InSinkErator product only detects metallic objects after they’ve begun to cause damage to the disposal. Part of appliance giant Emerson Electrics, InSinkErator holds around 70% of the market share for sink disposals. The fictitious company, SMELIN, Sam created for the science fair is now legally registered in North Carolina as Samelin Innovations, LLC. 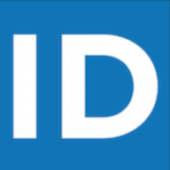 The company is a fledgling new business with a patent-protected invention as its foundation. Since Samelin Innovations applied for the patent in 2012, they have hired Charlotte-based Enventys to work out the bugs and develop a prototype. The Enventys product development team specializes in engineering, industrial design and prototyping. The team that helped to engineer Tom’s bone press invention is now tasked with accomplishing the same goal for Sam: optimizing her device’s design, wiring and sensors so that it is manufacture and/or license ready. When they determine how to bring the Silverware Saver to mass audiences, they have two options. The first would be to license the product and sell the rights to a major sink disposal manufacturer. Companies like Kitchen Aid and InSinkErator would be able to use the Silverware Saver to improve upon their existing sink disposal designs. They also already have the infrastructure in place to produce the product on a large scale and deliver it to interested retailers. Another option would be to manufacture the Silverware Saver as an accessory for existing sink disposals. Seeing that large companies like Kitchen Aid and InSinkErator already produce a large number of conventional sink disposals, Samelin Innovations could sell the Silverware Saver as an add on. They could simply develop a sensor ring that works with any existing sink-disposal configuration that’s wirelessly connected and programed to shut off their existing disposals. The future of Samelin Innovations, LLC is currently uncertain, but looking very bright. Another future that’s looking bright? Samantha Melin’s. As a student who seems to exceed any and all expectations put in front of her, she accomplishes anything she puts her mind to. Teacher Jamie Bonnetti predicts Sam could be anything from a professional opera singer to a dentist.